The inspiration for Tourne de Transmission’s collection comes from the idea of a lone traveller forming a cross-cultural style as he journeys. This presentation was largely inspired by Tibet, with creative director Graeme Gaughan stating ‘Tibet is a place I find hugely inspirational, the clothing habits of its people and the way they put together colour is like nowhere else’. We can therefore see Tibetan influences in the silhouettes of the long, almost robe-like overcoats and the loose-fitting trousers that are worn by most of the models. The colours, besides the monochrome we expect to see from this brand, include camel, plum and blue with an eclectic multi-coloured yarn, checks and plaids also being thrown into the mix. The set was also nothing short of spectacular with Johnny Buttons, the art director, incorporating Tibetan influences by creating a backdrop formed by 3000 handmade prayer flags attached to a bamboo structure. Some of the models themselves are also clutching prayer flags affixed to individual bamboo poles. In addition to Tibet, Gaughan also created this collection as a tribute to Barry Kamen, a figurehead of the Buffalo movement of the 80s and stylist for Tourne de Transmission’s SS16 collection. 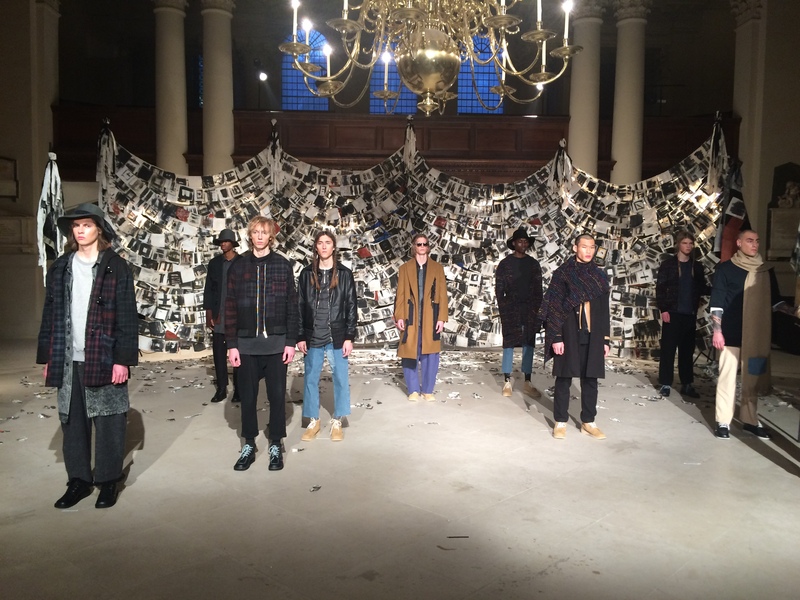 The styling of this AW16 show therefore reflects the radical and revolutionary spirit of the movement. Accessories come from varying companies with hats being designed by South African milliner Simon and Mary and clunky footwear being supplied by Kickers. Watches from Nixon are crafted with a deliberate vintage vibe and Ace & Tate have created modern clip-on sunglasses. Finally, the jewellery for the show was designed by Judy Blame, a friend and contemporary of Kamen who also found fame through the Buffalo movement.